1 Is it possible to prevent sports and recreation injuries? A systematic review of randomized controlled trials, with recommendations for future work. 2 Evidence-based preparticipation physical examination. 3 Does stretching help prevent injuries?. 4 What effect do core strength and stability have on injury prevention and recovery?. Bryan Heiderscheit and Marc Sherry. 5 Do foot orthoses prevent injury?. Karl B. Landorf and Anne-Maree Keenan. 6 Who should retire after repeated concussions?. 7 What recommendations should be made concerning exercising with a fever and/or acute infection?. 8 Should you play sport with a congenital or acquired abnormality of a solid abdominal organ?. Abel Wakai and John M. Ryan. 9 What type of exercise reduces falls in older people?. M. Clare Robertson and A. John Campbell. 10 Is there a role for exercise in the prevention of osteoporotic fractures?. 11 What is the role of ice in soft-tissue injury management?. Chris Bleakley and Domhnall MacAuley. Andrew Currie and Matthew W. Cooke. 13 NSAIDs and pain management in sports. 14 Benefits of regular exercise in the treatment and management of bronchial asthma. Felix S.F. Ram and Joanna Picot. 15 What is the role of exercise in the prevention of back pain?. Joanne Dear and Martin Underwood. 16 How should you treat spondylolysis in the athlete?. Christopher J. Standaert and Stanley A. Herring. Section 4: Injuries to the upper limb. 17 How evidence-based is our examination of the shoulder?. Anastasia M. Fischer and William W. Dexter. 18 How effective are diagnostic tests for the assessment of rotator cuff disease of the shoulder?. Jeremy Lewis and Duncan Tennent. 19 How should you treat an athlete with a first-time dislocation of the shoulder?. Marc R. Safran, Fredrick J. Dorey, and Duncan Hodge. 20 Are corticosteroid injections as effective as physiotherapy for the treatment of a painful shoulder?. Daniëlle van der Windt and Bart Koes. 21 How should you treat tennis elbow? An updated scientific evidence-based approach. Alasdair J.A. Santini, Michael J. Hayton, and Simon P. Frostick. Section 5: Injuries to the groin and knee. 22 How reliable is the physical examination in the diagnosis of sports-related knee injuries?. Anthony Festa, William R. Donaldson, and John C. Richmond. 23 What is the optimal treatment of acute anterior cruciate ligament injury?. Graham Bailie and Ian Corry. 24 What is the most appropriate treatment for patellar tendinopathy?. Jill L. Cook and Karim M. Khan. 25 How do you treat chronic groin pain?. Peter A. Fricker and Greg Lovell. Section 6: Injuries to the lower leg. 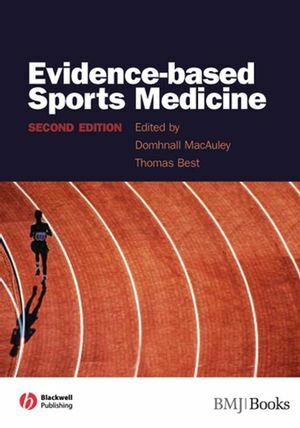 26 How evidence-based is our clinical examination of the ankle?. 27 Can we prevent ankle sprains?. 28 How should you treat a stress fracture?. Kim Bennell and Peter Brukner. 29 What is the best treatment of subcutaneous rupture of the Achilles tendon?. Deiary Kader, David J. Deehan, and Nicola Maffulli. 30 How to manage plantar fasciitis.